When it comes to compiling a list of the most acclaimed horror movies of 2014, one title will be near the top of nearly every critic's list. Jennifer Kent's psychological chiller has drawn plenty of praise, but how much of the hype is justified? Can it possibly match up to the weight of expectation resting on it? SPEEDY SYNOPSIS: I’ll try not to spoil too much here but read on at your own risk. Amelia (Davis) is a woman on the edge of a complete mental breakdown. Widowed when her husband Oskar (Winspear) crashed the car as he took her into hospital to give birth to their son Samuel (Wiseman), she has become consumed by grief. As a single parent her career as a writer has been put on hold while she works shifts on a geriatric ward to provide for her boy. Samuel has grown into a troubled boy, obsessed with magic and monsters. The deeply fractured relationship he has with his mother (a woman who secretly resents his existence, knowing that Samuel’s birth has cost her the man she loved) has left him psychologically damaged too. His aunt Claire (McElhinney), Amelia’s sister, doesn’t want him at her daughter’s party, and when his fascination with boobytraps and weapons sees him take a home-fashioned crossbow into school, Amelia is forced to bring him home. 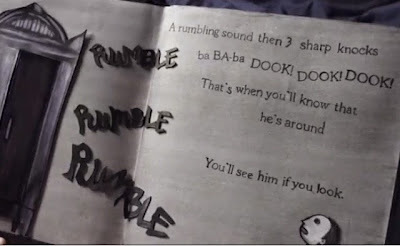 It is while they are both at home that Samuel discovers a strange book on his shelf, one entitled Mr Babadook. Amelia reads it to him, but when it takes a turn for the darker Samuel is left terrified. From that point the desperate Amelia must contend with Samuel's adamant assertions that the frightful Babadook is stalking them. Is this just another figment of the distressed boy's wild imagination? Where did the mysterious book come from? And can the rapidly unraveling Amelia cope with the shadow haunting her family — whatever it truly is? THE BEST BITS (mild spoiler warning): The Babadook boasts some of the very finest displays of acting ever in a genre flick. This is not an exaggeration — between them Davis and Wiseman are astonishing. The relationship between them is frighteningly realistic and heart-breakingly sad. Davis is incredible in the role, veering from desperately disturbed to terribly disturbing. She has a palpable fragility in her performance, a sadness that seems to seep out of her and tinge everything around her. Kent’s story gives her some supremely challenging things to do and she is more than up to the task. As a parent I’m all too aware of those dark moments that slip into your mind in the middle of the night when a screaming child is depriving you of sleep and, for a split second, you find yourself truly wondering if you really were cut out for this. The character of Amelia has been living that ‘split second’ continuously for nearly seven years and she is drowning. Her life has fallen apart, she is alone and Davis brings this to life so frighteningly well that you can feel your heart breaking as you watch her clawing at the world around her. Her only true relationship is that with her son — the person whose very being causes her the worst harm. Sure she has a fraught relationship with a sister who has lost patience with a woman unable to move on, and her kind neighbour, Mrs Roach (an absolutely fantastic West) and likeable colleague Robbie (Henshall) are trying to get close, but Amelia's bubble of barely restrained grief will not let them near her. Instead she is focused on the failing relationship with Samuel, not fixing it, but sticking at it through a sense of duty. Wiseman as the other lead in this story is a real revelation. Naive and unnerving in equal measure, he is undoubtedly one of the very worst kinds of problem child but he is sympathetic. Wiseman provokes real emotional investment from the audience, whether you're shocked at his outlandish behaviour or feeling his own pain. At times Amelia’s angry outbursts towards him are unbearable, especially as they are only ever met with the unconditional love of a child for his mother. This is the true strength of The Babadook, the very real, very complicated relationship at its heart. Kent has written a genuinely moving story, a character drama dressed in the ghoulish garb of a horror story. This isn't to say that there are no scares in the film — far from it. A late night bedroom scene has to rate as one of the most terrifying scenes of the past decade, while a simple voice at the other end of a phone call actually prompted me to swear at the screen. These chills are not of the cheap 'Yargh boo!' jump-scare variety — they are properly crafted, well-worked and well-deserved, and all the more frightening for it. The book is hideously creepy (so obviously I NEED one) and the design of the titular Mr Babadook (including THAT voice) the stuff of nightmares. The film cleverly doesn’t overplay its hand with this fairytale monster, giving glimpses as to what it truly is and the purpose of its haunting. In a little while, once you, my readers, have all had a chance to check it out, I’ll write my theory down in a feature as to what exactly the top-hatted demon truly represents, but for then I’ll leave it up to you all too interpret. The clues are there, and encourage plenty of very lively debate. So the film features a wonderfully complex, sad story with believable, well-rounded characters brought to life by a truly magnificent cast. Yet it has so much more. Kent shoots the film beautifully, especially the scenes in the family’s grey, lifeless home. The building is very much a physical manifestation of the state of grief in which they live, with its dark lightless halls and drab colourless walls. The whole film seems to be shot through a filter of sadness, the colours almost too depressed to shine through. Kent's direction and pacing are beautifully assured, allowing the story — and most importantly the mood — to wash over the audience before snatching us up and carrying us away to its dizzying, breathtaking conclusion. THE WORST BITS (minor spoiler warning): As I said before, The Babadook was really not the movie I was expecting. By selling the movie as a pure terrorfest I feel it was done a disservice — and could also alienate a lot of viewers. More than anything, this is a fantastic, moving and disturbing character study, with a fascinating use of symbolism to explore some very weighty emotional themes. I loved and appreciated this side of the film — but horror fans who want blood, guts, screams and jumps will not. 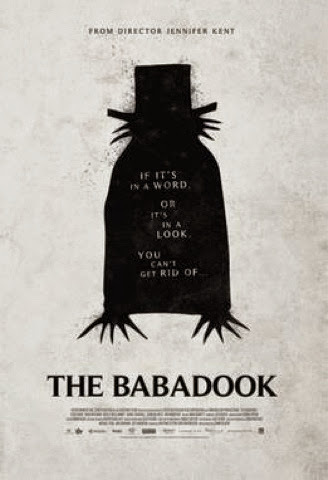 The Babadook has a languid and methodical pace, it weaves a slow and mesmerising web, but this will not suit everybody. Once again, the summer camp slasher fan may well find this story too slow, not scary enough and possibly a little weird. If this sounds like you, be warned. I did feel that the message of the film, important and refreshingly realistic as it is, was a little heavy handed. Much like the oppressive and overwhelming atmosphere of the movie, this message can also become a bit much. Finally, for those who understand the symbolism of the picture, the film's ending makes perfect and poetic sense, to those reading it more literally it could seem odd, unfinished, perhaps even anticlimactic. I can understand that take, but I urge you all to dig a little deeper, explore the movie and look at what it stands for, what it truly tells us about its characters and ourselves. With that in mind, you’ll see that it makes more sense than any other ending ever could. THE VERDICT: The Babadook is a wonderful movie — but not necessarily a great horror movie. For those with the patience to let it tell its story and willingness to dissect and examine it, it is one of the most truly moving and rich viewing experiences in some time. Kent has crafted a beautifully ornate puzzle box of a film, a character study with some legitimate frights and some genuinely brilliant performances from a sterling cast. I cannot guarantee that you will all love The Babadook (although I know a lot of you will), however, I can guarantee that it will live on in the darkest corners of your mind for years to come. The film gets its home release here in the UK on 16th February, so be sure to check it out. Please do let me know your thoughts on the film, I’d be fascinated to hear what the readers of Hickey's House of Horrors think about it. Until next time, I hope you enjoyed your stay.